ABOVE IS ASERES CHABAD you should review aruch hashulchan too properly understand the aseres issues. 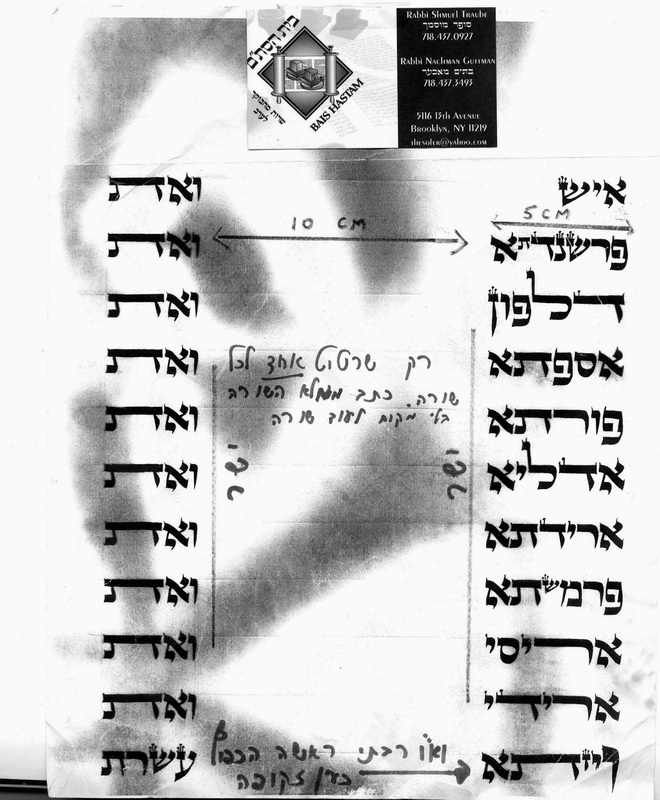 Above is aseres like chabad does it the gra HAD A SIMILAR MEGILA BUT WITH THE ASERES ON THE BOTTOM 11 LINES. Can someone tell me the makor for the small, tav shin, zayin and the big vov? Now interesting. It's important to note that in the Megillah of the Rebbe Maharash, the Names of the 10 Sons of Haman did not appear in a straight column (YASHAR) as it appears in the above picture. This is a newer convention. I will soon post a picture of the Rebbe's Megillah so that you may all be able to see. it is interesting to note that the keses paskens we should make the vav -big AND the rosh hanging.the m"b (biur halacha 14)says that the minhag is just big vav. It is famous that תשז is a remez to the Nurenberg trials. but the mesora of these small letters are [at least] from the rishonim [hagahot maymonyot in the name of Maharam. If I renmeber well, he quotes that this was in the megila of Mahahram]. Other reasons given prior to what the "Kiruv" organizations have diffused shed a bit more light. PARMAshTA (a small shin). He tried to destroy the observance of Shabbat. VAYzATA (a small zayin). He tried to destroy the observance of the major Jewish holidays which are celebrated on seven occasions. The vav of Vayzata is very long. It is compared to the pole of a boat which the helmsman uses to push his boat away from the shore. The vav is elongated because all ten sons were hung up on this pole (Megilla 16b).